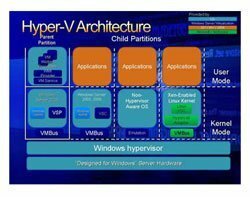 Microsoft has released the final test version of its virtualisation software, Hyper-V, for public testing. The company said it was on target to deliver the final version of Hyper-V for release by August 2008. John Abbott, an analyst at the 451 Group, said virtualisation technology included as part of Windows Server 2008 would give Microsoft an inroad into VMware's customer base. But Microsoft's main rival VMware already has a huge market lead in virtualisation. The previous beta release of Hyper-V was included with Windows Server 2008 when it launched last month. This version provides updated, near-final code. Bill Hilft, general manager of the Windows Server division, said the release would help Windows Server 2008 customers prepare their IT environment to receive the final version. When final code becomes available, product partners, including AMD, Dell, Fujitsu and Intel, plan to integrate support for Hyper-V into their virtualisation products, including pre-installation on servers, device support and services. Server virtualisation allows multiple operating systems to run on one physical machine but as separate virtual machines, which can save hardware costs.